Mauricio Dubon came through in the clutch twice for Portland, plating the tying and winning runs. Dubon, who went 3 for 4, jacked his fifth Double-A home run in the fifth and drove in the eventual winning run on an RBI double. Mitch Atkins followed up his last start with yet another excellent seven-inning outing. The 30-year-old righty struck out a season-high ten and walked just one. He worked around seven hits and a two-run home run in the second inning. Trenton got the tying run to third and the winning run on first, but Luis Ysla struck out the final batter to hold on for his third save. Nate Freiman drove in Portland's other two runs. 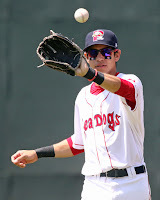 Michael Chavis continued to pay dividends on his recent promotion, having now collected a hit in all three games at High-A. He went 2 for 4 with a walk, two runs scored, and his first stolen base for Salem. That was one of four thefts on the game for the Red Sox. Chavis did commit one of three Salem errors. Jayce Ray went 2 for 4 with a triple, a run scored and three RBI. Joseph Monge set the table well out of the leadoff spot, going 3 for 5 with a double, three runs scored and his 19th stolen base. Matt Kent posted a quality start, giving up three runs (two earned) on four hits in 6 2/3 innings to pick up his tenth win. He struck out three and walked two. Jake Cosart remained unscored upon at High-A - but just barely. After recording two quick outs in the eighth, two walks, a hit batsman, and a wild pitch brought the tying run to the plate, but Cosart retired the side with his 19th strikeout in 11 innings. Greenville's offense was stymied, held to just two hits on Thursday. Luis Alexander Basabe was one of the lone bright spots, reaching base three times. He went 1 for 2 with a pair of walks and stole his 23rd base of the season. Enmanuel De Jesus was roughed up in 4 1/3 innings of work, giving up five runs on nine hits. He struck out three, walked two and gave up a two-run home run. Josh Ockimey was held hitless, but he did drive in his 60th run on a groundout. The Spinners erupted for 14 hits, as eight of the nine starting batters collected at least one hit. Bobby Dalbec continued his torrid pace for Lowell, extending his hitting streak to nine games with a 2-for-3 effort. He tripled, drove in a run, scored twice and also walked two times. He now sports a lofty .394/.447/.734 slash line. Catcher Tyler Spoon had a big game, going 3 for 5 with three RBI and a run scored. Josh Pennington posted possibly his strongest outing of the season, throwing six shutout innings. He gave up three hits, walked two and struck out six. Dioscar Romero picked up the save with three innings of no-hit relief. The GCL Sox came alive late, scoring all nine of their runs in the last three innings to take sole possession of first place in the GCL South Division with six games remaining. The Sox took advantage of five errors and two wild pitches by the Rays in those innings. Lorenzo Cedrola went 1 for 4 with a run scored, driving in three. 19th-round draft pick Kyle Hart kept his ERA at 0.00 with four scoreless innings in his third professional start. He allowed just two hits, struck out five and did not allow a walk. Denyi Reyes picked up the win with four innings of shutout relief. The game was called after the top of the ninth due to rain. Player of the Night: Coming up clutch twice gives Mauricio Dubon the edge from the day's games. Dubon has been red-hot in the month of August, hitting .375/.398/.663 with four of his five home runs he has hit since his promotion to Portland. Dubon has created an incredible amount of contact on the ball this month, striking out just seven times, but also walking only three times in 80 at-bats.